Thank you for looking at my profile. 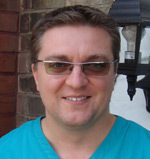 I have been caring for my patients at Nelson Road Dental for over 5 years. My gentle and caring approach allows nervous patients to build confidence in their dental visits. I have just completed a year programme in cosmetic dentistry, which allows me to carry out safely whitening procedures, mercury free fillings and smile makeovers. Outside dentistry, I love spending time with my wife and family. I also love travelling and meeting new people. I look forward to meeting you and helping you with your oral health needs.